Want to enjoy perfect weather with a touch of Charleston, SC style? 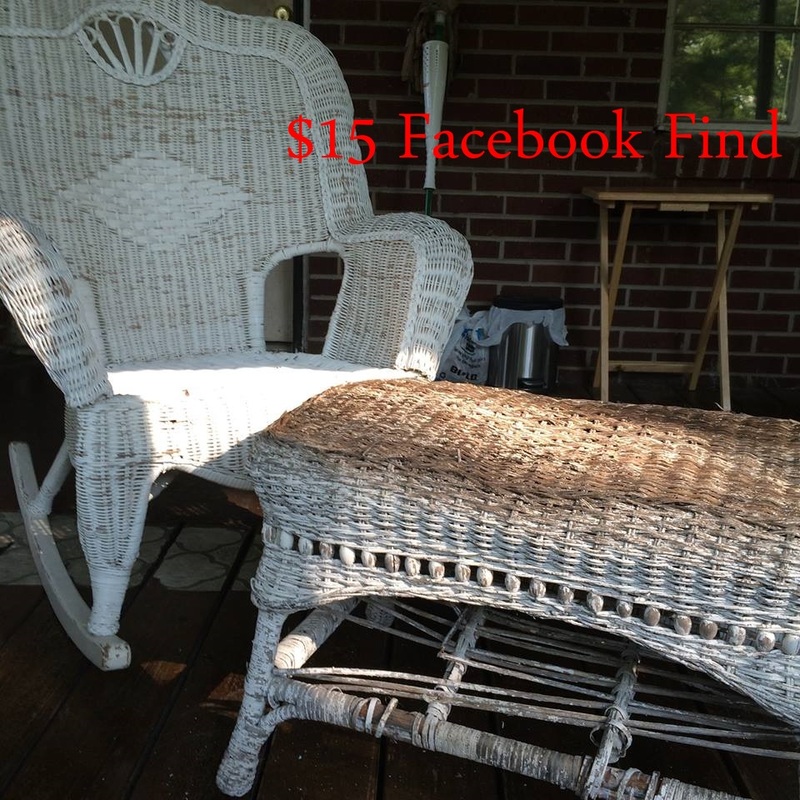 Check out this fabulous Charleston Green $5 trash to treasure wicker furniture rehab and outdoor pillow diy using $4 tablecloths! Sorry it has been a while between updates. I have been super busy over the last month or so. However I have tried to keep the projects going amidst the mayhem. Currently I'm in the process of making over some old wicker furniture and creating new outdoor throw pillows and cushions using inexpensive outdoor, picnic style table cloths. I thought I would share my progress thus far with you guys...like how I created the above ensemble for $7. 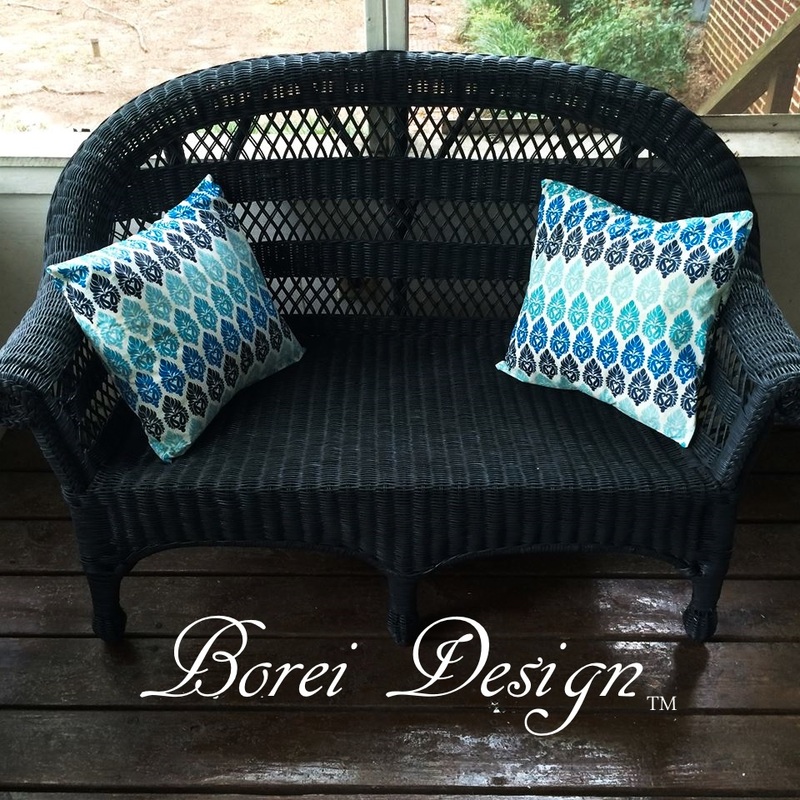 Have you noticed how many outdoor furniture stores are selling a lot of cheap, plastic looking, faux wicker these days? 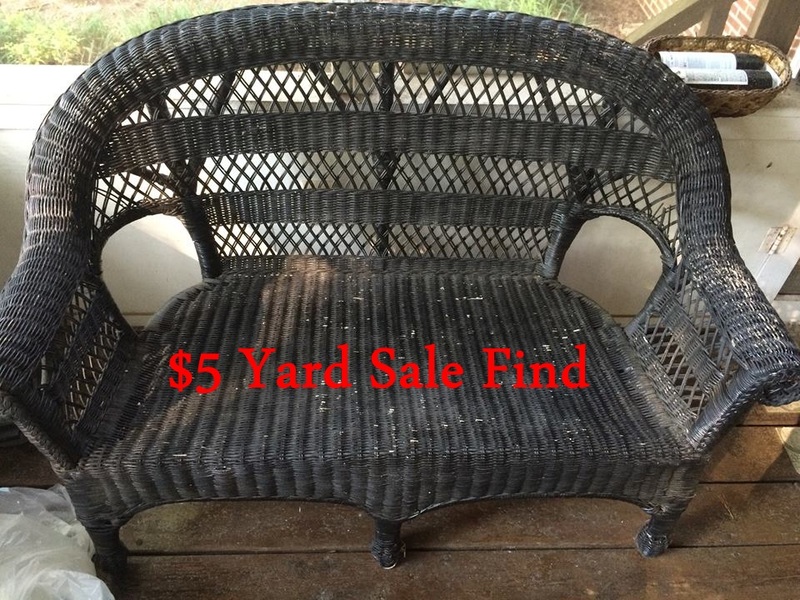 What is a "real" southern porch without "real" wicker? In lieu of purchasing overpriced junk that I would never be satisfied with, I decided to transform some of the old traditional wicker pieces into exactly what I wanted...the fact that I'm an obsessive upcycler may have also had a "little" to do with that decision as well. cough, cough. I started with this outdoor wicker love seat I picked up for $5 at a yard sale and added a matching rocker and table duo I snagged through a local Facebook sale page for $15. 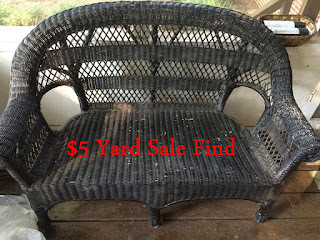 I have since added another wicker piece I picked up from a thrift store that I plan to work on as well. What? These are UGLY, you say? I LOVE ugly! I see ugly as a challenge. First I cleaned them up. 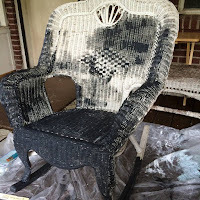 A wet cloth was enough to clean the love seat and rocker. A garden hose was necessary for the table. It had loose dirt caked down inside it. 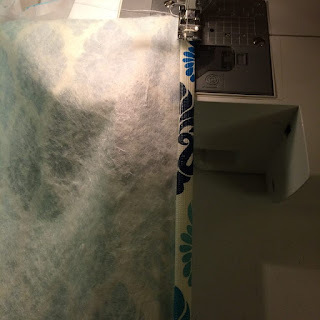 I also used the wet cloth to help smooth down any frayed wicker fibers. I used a strong all purpose glue to reattach any loose wicker strips. I knocked the shelf out of the bottom of the table because it was so far gone, it was not worth the effort in my opinion. Luckily there were no missing strips on the rocker or sofa. I am going to have to replace some wicker strips on the base of the table but haven't quite got around to it yet. 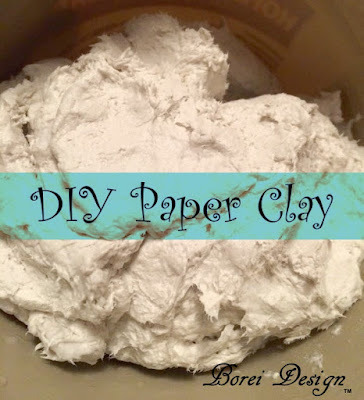 To do so, all you have to do is purchase replacement wicker strips, soak them in water to make them pliable and attach to the piece were needed with glue. After the clean up, I painted the pieces using acrylic indoor/outdoor paint in "Charleston Green" by Sherwin Williams, #DCR009. 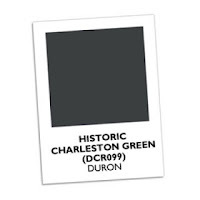 "Charleston Green" is just not just your average color. 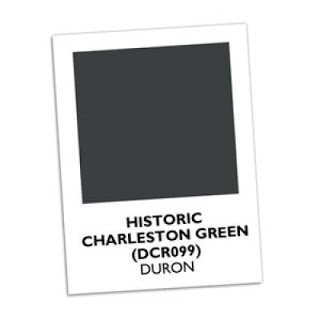 It is a color steeped in historical significance and I'm totally psyched that Sherwin Williams has done their research and made this color available to us today. 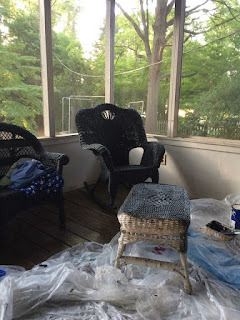 To learn more about it, be sure to check out my first post in this series: Life on A Southern Porch Part 1: Going "Haint Blue" & "Charleston Green"
I used a regular paint brush and just really worked the paint into the wicker. I used a small art brush to work the paint into the nooks and crannies that I could not reach with the larger brush. 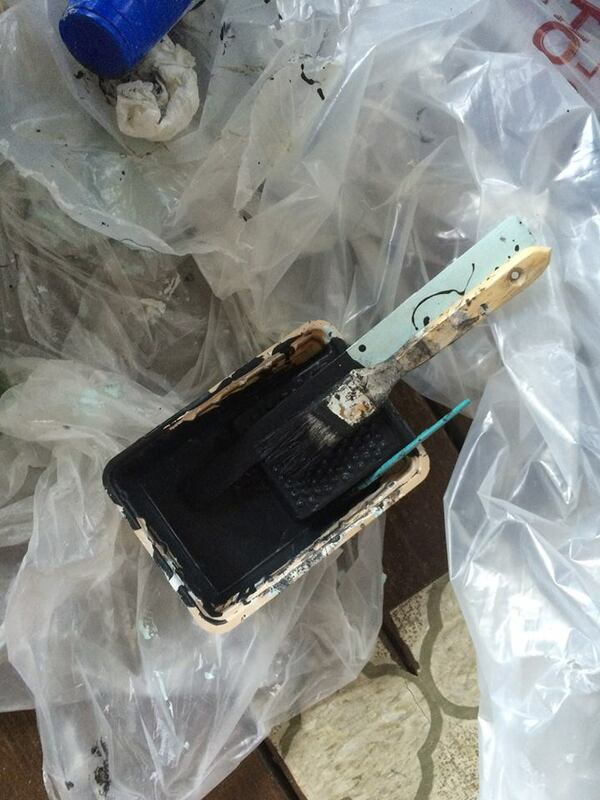 I would strongly suggest the use of a paint sprayer to save time. I will most definitely invest in one for future projects. Note: I'm a big fan of canned spray paint in general but not for large wicker projects. 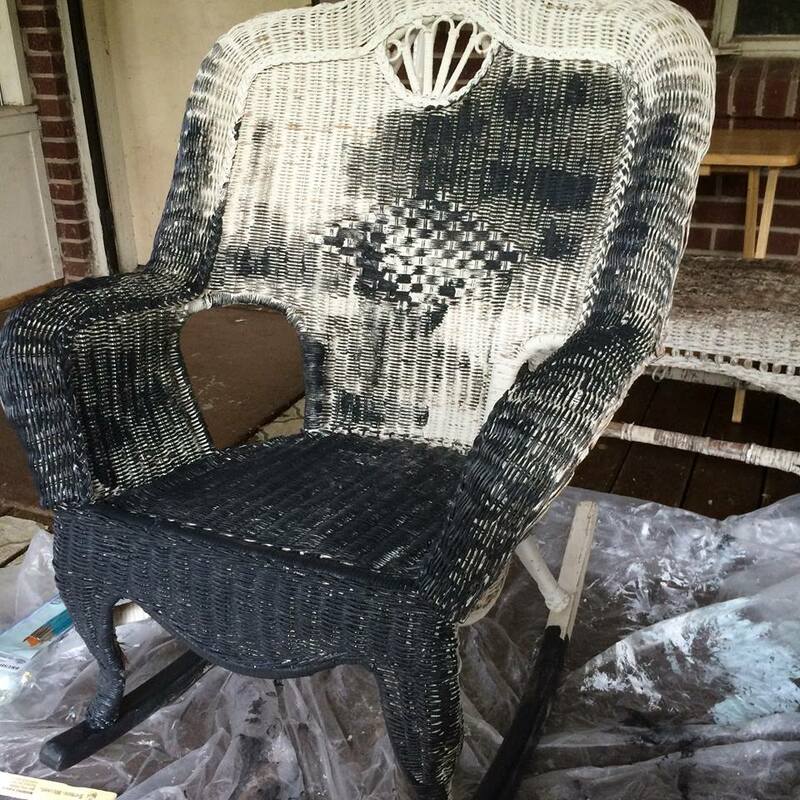 I have used canned spray paint in the past on large wicker pieces and I was not satisfied with the results. Spray paint often comes in limited in colors and wicker soaks up a ton of paint. I think I used a gazillion cans and still did not get the coverage I desired. My suggestion is to stick to the indoor/outdoor acrylic and use a paint sprayer or a brush for the best coverage. The porch I'm working on is covered and screened. However, when the wind blows hard, the rains still sometimes manages to sometime sweep in and soak everything. 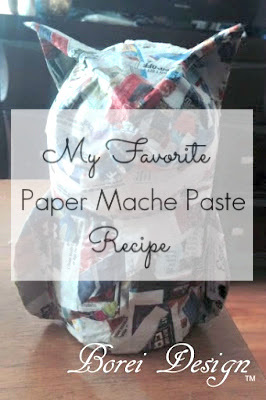 Because of this, I knew I needed some type of water resistant fabric and lots of it! I need to make a lot of new pillows and cushions and I knew buying the fabric in such large amounts would get expensive. When I saw these picnic style table cloths on final clearance at a local dollar store, inspiration struck. It's the inexpensive kind that is spill resistant on one side and slightly fuzzy on the other. 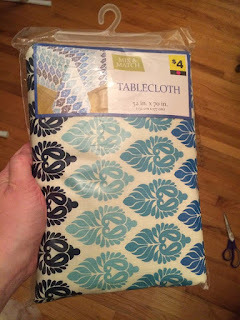 I snagged all that was left in this pattern for a mere dollar or two a piece. 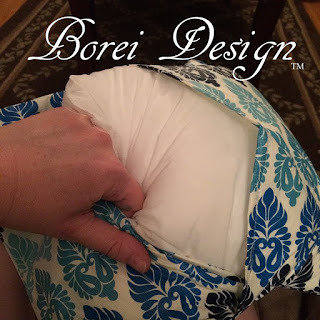 I decided to use them to sew the water resistant covers for my pillows and cushions. 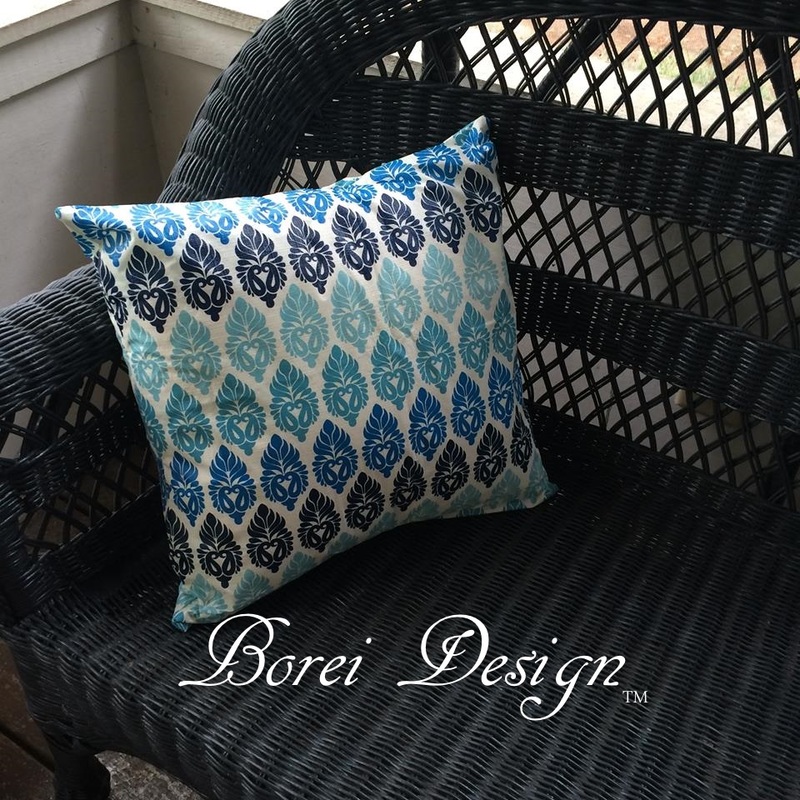 Now I'm going to show how I created two of the throw pillows. 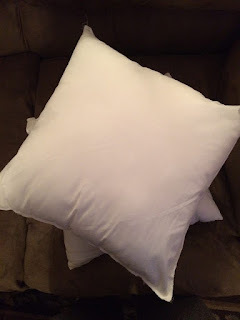 I started with an unused pillow form I had laying in the bottom of my closet for quite a while and made another pillow form the same size by cutting down an old bed pillow. To make the form from the bed pillow, I simply ripped out two of the side seams, removed the stuffing and cut it down to the desired size. I then stuffed the re-sized pillow and sewed it shut. This is a great way to reuse old bed pillows. 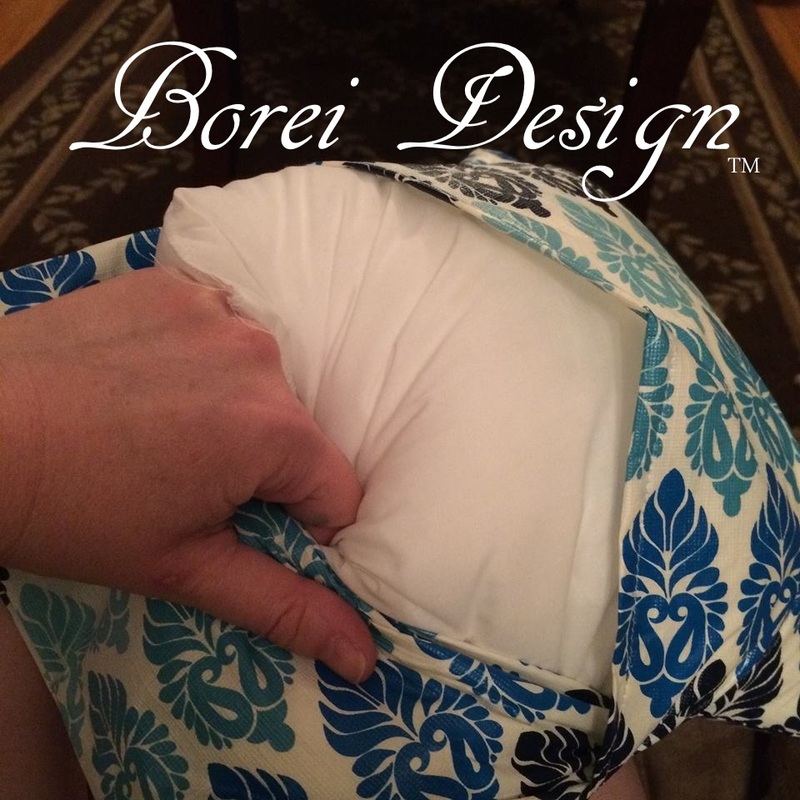 New pillow forms can be purchased at most major craft & sewing supply stores. 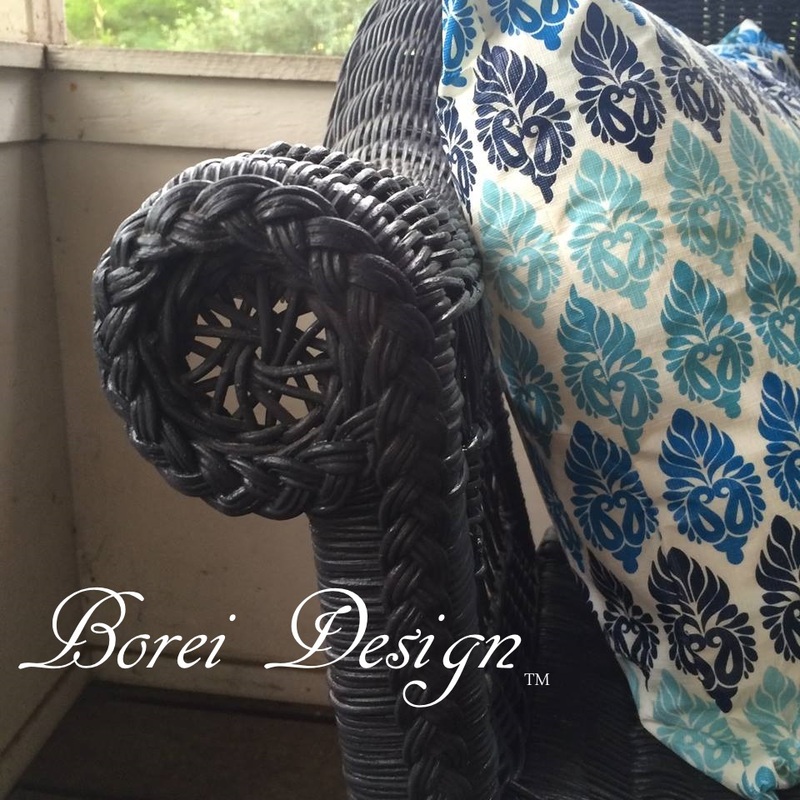 The pillow forms I used (both the one I had on hand and the one I created) were a finished 16x16 inches in size. You can choose to buy or make forms in whatever size you need . 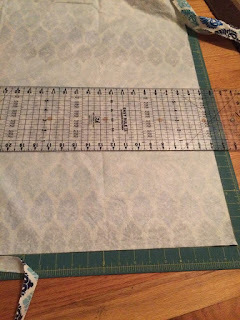 Next, take one of the back pieces, fold the edge (along the center back cut you created)1/4 of an inch inward towards the wrong side of the fabric. Then fold it 1/4 of an inch inward once again, pin and sew down. 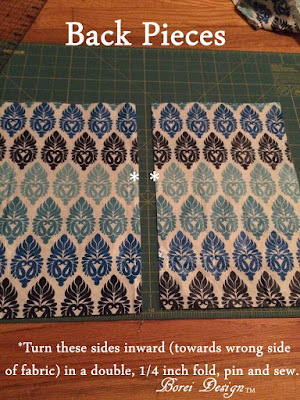 Repeat this step with the other side piece. 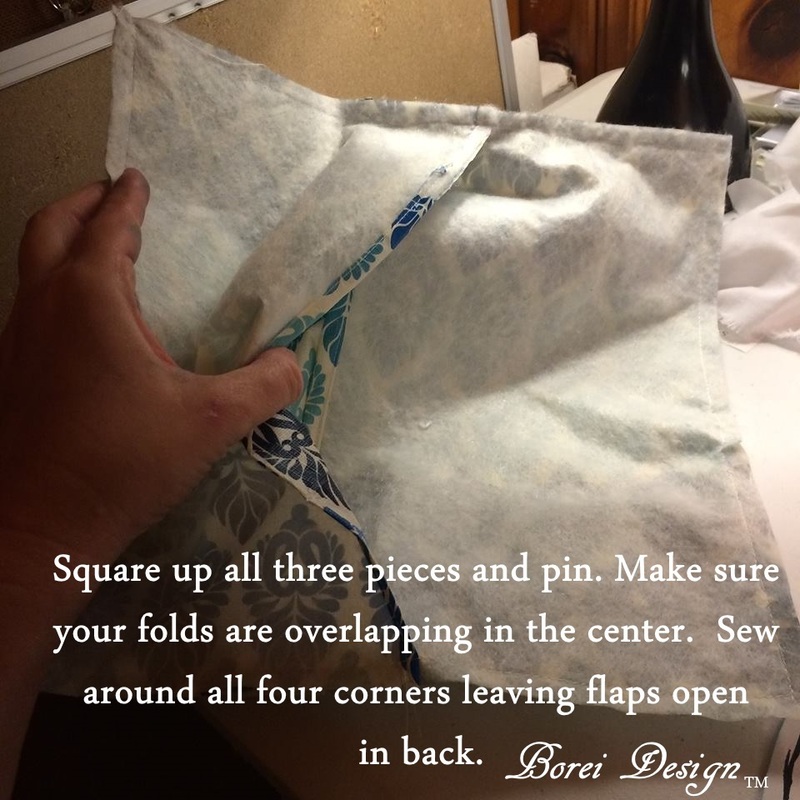 Once the both the folds are sewn in place, square up all three pieces, right sides together, wrong sides facing out. 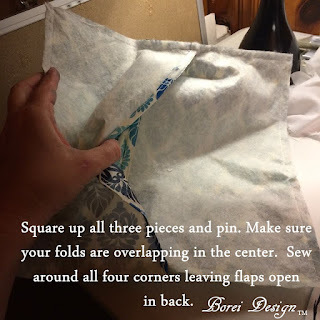 Over lap the folds you created toward the center, pin and sew around all four corners of the square using a 1/4" seam allowance. 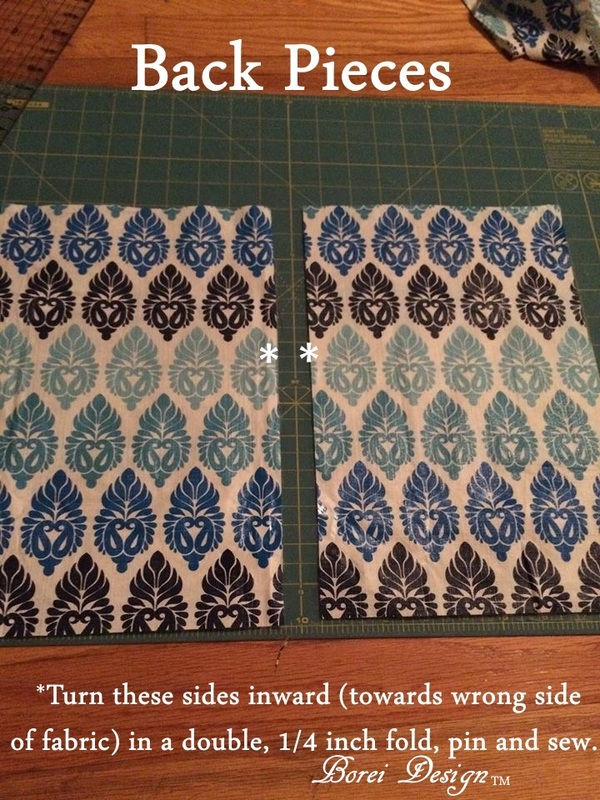 To finish up, turn the cover right side out and insert your pillow form. Ta-da! All done. I love that these covers are inexpensive, water resistant and I can easily change the colors or patterns with new covers anytime I want. With the paint on hand, I created the love seat and two pillows (pictured below) for a mere $7 and I love that I turned what was once a flea market cast off into a great new treasure. 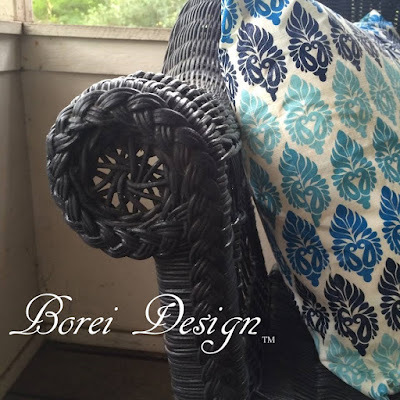 Be sure to check back soon for an update on this and other furniture and decor projects in this porch project series. If you missed part one of the series be sure to check out "Life on A Southern Porch Part 1: Going "Haint Blue" & "Charleston Green." Thanks so much for visiting and until next time, happy upcycling! Turned out beautiful! 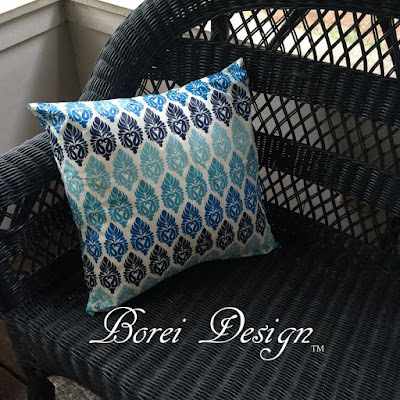 Love those pillows I need to find a tablecloth and make me some now.